Soon I'll put up a few more examples for the Nonfiction Illustrated course. In the meantime, I have been assembling a set of sources for my Postwar American Visual Culture seminar. 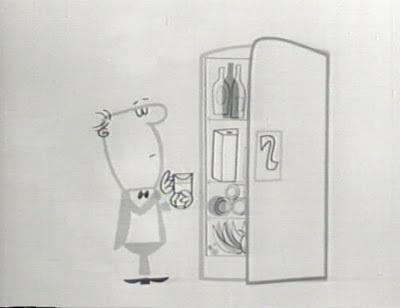 Among my interests in this area is the use of surprisingly sophisticated animated television spots drawing on the emerging modernist strand of animation design in the 1950s, pioneered by UPA. I have renewed my relationship with a wonderful book by Amid Amidi, Cartoon Modern: Style and Design in Fifties Animation (Chronicle Books, 2006) and secured a few DVDs fromMedia Burn, a great media history outfit with a fascinatingly diverse collection of videotape materials. Through the latter I have acquired a set of 1950s advertisements. 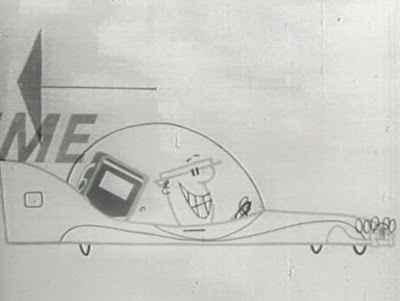 I'll post a few frames from a variety of things, but for now, two stills from a Chevron Supreme ad from 1958. Happy Birthday, David D. Dowd, Jr.! Doug Dowd January 31, 2010 Happy Birthday David D. Dowd Jr.!